Natalya Weinstein is an accomplished violinist/fiddler and teacher in a variety of styles such as old-time, bluegrass and klezmer. She resides in Asheville and performs with her husband, John Cloyd Miller in Zoe & Cloyd, a nationally touring acoustic Americana duo. Natalya comes from a musical family: her father is master jazz pianist and her grandfather, originally from Russia, was a professional klezmer musician. Having performed at many prestigious festivals and events all across the country, Natalya is also a champion fiddler, winning contests in both the North and South. While trained classically in her home state of Massachusetts, she has spent many years fine-tuning her bluegrass and old-time fiddling with some of the country’s top traditional musicians. Now a mentor to many young players, Natalya is a sought after instructor and is in high demand as a teacher and session musician. 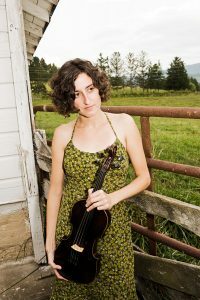 She recently received an MA in Appalachian Studies from Appalachian State University, focusing her thesis on the development of bluegrass fiddling.